Hailed by Life magazine as one of the great preachers of the twentieth century; a spiritual advisor to Martin Luther King, Jr., Sherwood Eddy, James Farmer, A. J. 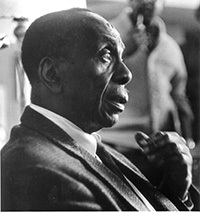 Musty, and Pauli Murray; the first black dean at a white university; cofounder of the first interracially pastored, intercultural church in the United States; Howard Thurman (1899-1981) was a man of penetrating foresight and astonishing charisma. His vision of the world was one of a democratic camaraderie born of faith, and in light of today's global community, one of particular importance.